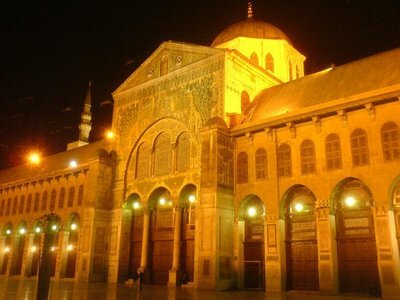 The Umayyad Mosque in Damascus. Photograph 2007 via Wikimedia Commons. EXECUTIVE SUMMARY: The sarin attacks in Syria of August 2013 and April 2017 resemble one another closely. They reflect a strategic mode that might be repeated yet again by Assad, as long as he remains fully backed by Russia and Iran. At the same time, the geopolitical shift suggested by the recent US military response in Syria marks a desirable turn with consequential implications regarding the ongoing relationships among the US, Syria, Russia, and Iran. Although the accumulating evidence is not yet formally conclusive, it appears that chemical weapons (CW) containing the sarin nerve agent were employed by the Syrian regime's air force against Khan Shaykhun during the massacre of April 4. Over the past few years, the Syrian regime has used industrial chlorine gas as CW many times. There also appear to have been several cases of sarin use, with a particularly notorious event (a sarin attack with many more casualties than there were in Khan Shaykhun) taking place on August 21, 2013. In that earlier event, which occurred at around 2:30 am, two opposition-controlled areas in the rebel-held Ghouta suburbs around Damascus were struck by surface-to-surface rockets (120 mm and 140 mm) containing sarin. The death toll was approximately 1,400 people with about 3,600 wounded. The area was on a rebel weapons supply route from Jordan and had been under siege by the Syrian military and Hezbollah for months. The attacker was unambiguously the Syrian regime. The disclosure of this event led to the Syrian regime's undertaking to hand over its complete CW arsenal to the international community. The more recent sarin attack on the town of Khan Shaykhun in the Idlib Governorate represented a similar mode of assault. The town is on the main highway between Damascus and Aleppo, and at the time of the attack, was under the control of Tahrir al-Sham (formerly known as the al-Nusra Front). The attack took place about 15 km from regime, Russian, Iranian, or Hezbollah forces. It was conducted at 6:30 am, before most children and parents had left for school or work. Heavy air strikes by government forces preceded massive civilian chemical poisoning. The release of a toxic gas, most likely sarin, killed about 85 people and injured about 570. The symptomatology was consistent with nerve agent intoxication, a supposition later unequivocally proven through autopsies. Communications between Syrian military and chemical experts, intercepted by US intelligence prior to the sarin attack, furnished direct Syrian regime linkage to the attackers. The ammunition containing the sarin that was dropped on Khan Shaykhun was apparently delivered by bombs or rockets carried by Syrian jets. The objectives underlying the employment of sarin in both cases were more than simply to kill and intimidate. Sarin provided an additional element that conventional warfare, and even chlorine gas, do not: In addition to inflicting death and extreme suffering, the lingering horror of sarin is apt to bring about population displacement. The target populations in the two sarin attacks were ordinary families, not fighting manpower. Assad approved both operations. After they had been concluded, the regime issued a full denial, backed up by massive, dissembling Russian – and secondarily Iranian – support. Assad's Syria constitutes a cardinal, unparalleled military foothold for Russia in the Middle East. Russia can thus scarcely be expected to give it up, or to confront Assad over the CW issue. The same applies – regarding both Syria and Lebanon – to Iran, which would prefer a Syrian regime fully equipped with CW. Deliberately or not, the Syrian-Russian-Iranian nexus allowed Assad to dare to use sarin again, after more than three years during which he relied primarily on chlorine. The sarin option was, in fact, available to Assad throughout that period. Assad retained and concealed sarin during the purported chemical disarmament of Syria. This conduct was likely coordinated, at least in part, with Russia and Iran. While we do know what quantities of CW were taken out of Syria and destroyed by the international community, it is not possible to accurately estimate the size of the whole Syrian CW inventory as it existed before disarmament commenced. Syrian declarations, which are false, are no help in this regard. Obviously, the Syrian CW arsenal has not been dismantled. The remaining arsenal could change the game in Syria if employed without limitation. The recent sarin attack offers a glimpse of Assad's conduct within that context when he is not rigidly restrained. Moreover, in retrospect, the sanctioning (in January 2017, by the Obama administration) of 18 senior Syrian officers for CW employment seems to reflect an orderly, functional alignment within Syria that retains CW capacities and operational competence. Assad's regime evidently did not abandon its fundamental paradigm concerning the strategic urgency of CW for Syria. And the recent sanctioning by the Trump administration of 271 employees of the Scientific Studies and Research Center – a body that contains Syria's elite CW-related scientific manpower, and that has remained nearly intact – will likely weaken the nucleus of the Syrian CW apparatus. The alleged Russian involvement in the Khan Shaykhun affair is highly significant. The US is almost convinced that there was such involvement (there was, for example, a Russian-operated drone over a hospital as victims of the attack were rushing to get treatment). If so, it was a complicated joint operation. It failed, in that it was inadequately masked (although chemical ammunition remnants have not yet been found), and it generated an American military response unforeseen by Syria or Russia. This response was strongly indicative of the geopolitical shift currently being shaped by the US. The red line set by President Obama was brutally crossed by Assad in the form of the sarin attack of August 2013, which took place without retaliation. President Trump, by contrast, did adhere to that red line, responding to the sarin attack of April 2017 with a swift US military strike. This marks a shift in the Americans' tolerance of Assad's CW conduct and, collaterally, of his supportive allies, Russia and Iran. This geopolitical shift was the product of a preceding strategic-operational shift on Assad's part, possibly decided upon together with the Russians and/or the Iranians. to signal that the US maintains the option to militarily retaliate against future employment of CW. Assad claimed that the sarin dispersed in Khan Shaykhun was in fact the possession of the regime's adversaries, and was unintentionally released during the bombardment of the city. This argument is unsound, as the regime's adversaries do not possess nerve agents. Assad's broader claim that the Syrian regime has "never used CW" is a patent absurdity, particularly in view of the fact that the 2013 sarin attack was the antecedent that led to Assad's commitment to chemical disarmament. Regardless what was concluded between Tillerson and Putin, it can be postulated that as long as Assad remains in power, an operationally significant CW inventory will be kept covertly by the Syrian regime. It is unlikely that CW will be transferred into Syria by Russia, although such a move might be taken by Iran, particularly in an attempt to equip Hezbollah. While it is doubtful that Russia would actively assist Syria in maintaining its CW arsenal, Iran is ready and able to do so. It has possessed diversified CW ordnance for a long time, and has already provided technological support to Syrian production of CW in the past. The US attack delivered an indirect yet eloquent message to Iran about the potential consequences of transporting CW or CW essentials into Syria for the benefit of either Assad or Hezbollah. Eradicating whatever CW from Syria still remains is an unaccomplished mission of the utmost importance. Lt. Col. (res.) Dr. Dany Shoham, a microbiologist and an expert on chemical and biological warfare in the Middle East, is a senior research associate at the Begin-Sadat Center for Strategic Studies. He is a former senior intelligence analyst in the IDF and the Israeli Defense Ministry.